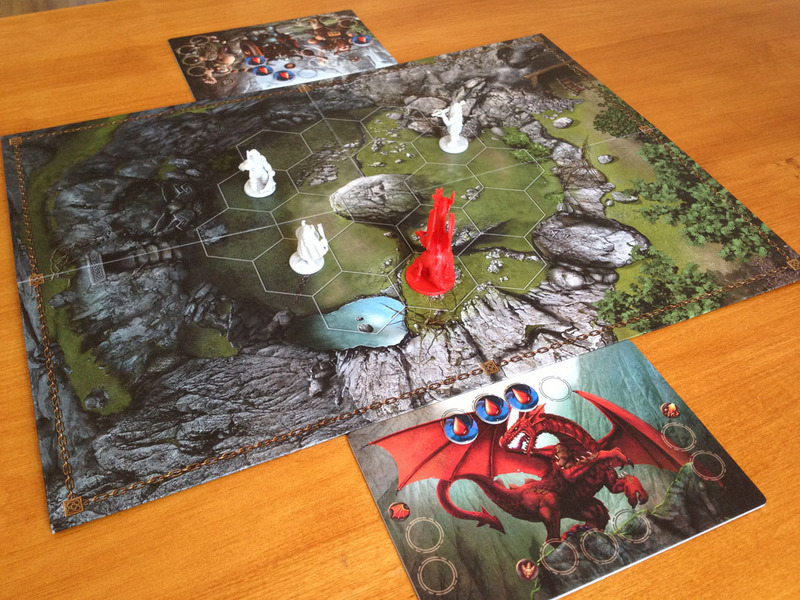 Drako is a 2-player, card-driven game by the designer who created K2 and The Cave. 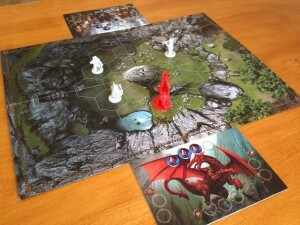 In Drako, 3 dwarves are pitted against one dragon with players taking turns drawing and playing cards from their hand. 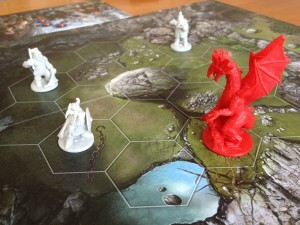 The two sides play very differently as each has their own specific deck of cards, plus the dragon is a single powerful figure which can fly around the board, use fiery breath and attack using powerful claws, whereas the 3 dwarf figures attack with their axes as well as each having their own special ability such as a crossbow or net. The game board shows a small hex-based grid which is the arena where the fight will take place. Each turn, a player gets to perform 2 actions: Draw 2 cards or play 1 card. (Players have a hand limit of 6 cards.) Some cards display more than 1 option but a player can only 1 of the card’s options when played. For example, dwarf options include move 1 dwarf, move 2 dwarves, attack with 1 dwarf, attack with 2 dwarves, defend, use crossbow, and use net. Each move and attack icon has a value next to it which determines the amount of movement or power of the attack. When dwarves attack, they need to be adjacent to the dragon which is dangerous because the dragon could strike on its turn. Each dwarf has a special ability – one can use the crossbow, one can throw a net (which stops the dragon from moving until they spend a full turn escaping it), and one can give the dwarf player 3 actions during a turn once per game. The dragon has similar options: move across the board, fly to any space, attack an adjacent dwarf, defend breath fire at range. However, the some of these actions are not possible if the dragon has taken too much damage to a relevant location – the first damage has no effect but after 4 wounds, the dwarf player chooses in which areas to apply the damage. For example, if a dragon’s wings have been damaged enough then it can’t use the flight option. The game ends if all the dwarves are killed or the dragon is killed. If the dwarf player plays his last card and the dragon is still alive, then the dragon player wins. Overall, Drako is a fast and fun game. I like the multiple options on the cards as it’s this game mechanic that means you can (and need to) work out what different combinations of actions to use. You need to think on your feet as the situation changes rapidly and you may be forced to use a card that you had plans for like to defend from an attack or to move when you weren’t expecting to need to. Tactical positioning on the board is very important. For example, the dwarves should avoid being neatly lined-up as the dragon’s breath affects an entire line, but then they don’t want to be too spread out or they won’t be able to take advantage of cards that allow 2 of them to attack at once. Choosing how to damage the opponent also contains a tactical choice – the dragon player can choose to focus on one dwarf at a time or lash out at any within easy reach; whereas, the dwarf player needs to decide which dragon abilities to destroy by applying damage. Luck plays its part in the game because sometimes you have the cards that combine well for what you want to do and sometimes you don’t. Also, it’s unfortunate if the cards you play are foiled because your opponent has just the right cards to defend against them or slip out of your trap. However, as Drako is a light game, this luck is okay especially as most cards have multiple options and it forces the player to use their cunning get the best out of the cards they have. The one thing I wish Drako had were some more choices of teams that could fight. For example, a few different types of Dragon that each have a different deck of cards, and/or some different races like 3 elves or 3 Norse warriors which have their own decks of cards. The game could still be one dragon versus one group of 3 warriors (so not necessary to allow dragon versus dragon, or group versus group). I’m sure adding extra figures would have increased the production cost too much, but just adding extra cards to allow players to play different types of dragon and tribes of dwarves (whilst using the same figures) would have been fine and not added too much cost. Having just 2 sides doesn’t detract from Drako but does feel like a missed opportunity which would have offered more variety in the game’s replay. To add extra variety, some obstacles could have been provided (such as hex tiles with rocks on) which could have been used to create different arena layouts (especially if some more hex spaces were printed on the board as there is room for these). However, for all the extra things I would have liked, Drako remains a very good, fast and light 2-player game. The asymmetric sides work well so you really do feel like two factions that work in very different ways are pitted against each other. There’s some luck-of-the-draw but I didn’t mind that as I felt I usually had some card combinations to use and it meant I had to work out new plans. 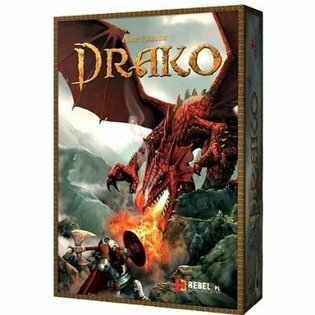 Drako works well as a 2-player game and is good value for money as it is relatively cheap, especially as it comes with figures, board and cards. This entry was posted on Tuesday, July 16th, 2013 at 2:04 pm	and is filed under Board Game Review, Board Games, Drako. You can follow any responses to this entry through the RSS 2.0 feed. You can leave a response, or trackback from your own site.